Why monitor our coral reefs? Guam’s culture is shaped by its traditions. Fishing is one of strongest links native Chamorros have to their culture. The only way to keep traditional fishing methods alive is to sustain coral reefs as they provide food and shelter to fish. As residents of Guam, we need to protect our coral reefs so they can continue to protect us and future generations. Why look at pictures when you can see it for yourself? By becoming a member, you learn how to do biological monitoring surveys used by marine biologists for coral reef monitoring. A perfect opportunity to earn service learning hours! Monthly monitoring events will be a solid source to complete quarterly Service Learning hours requirements. Contact us so that we can help you get started! Attend our Classroom Training session as part of our Community Monitoring Training. Here, you will learn about coral reef ecology, threats to our coral reefs, as well as different conservation activities and behaviors that help preserve our coral reefs. 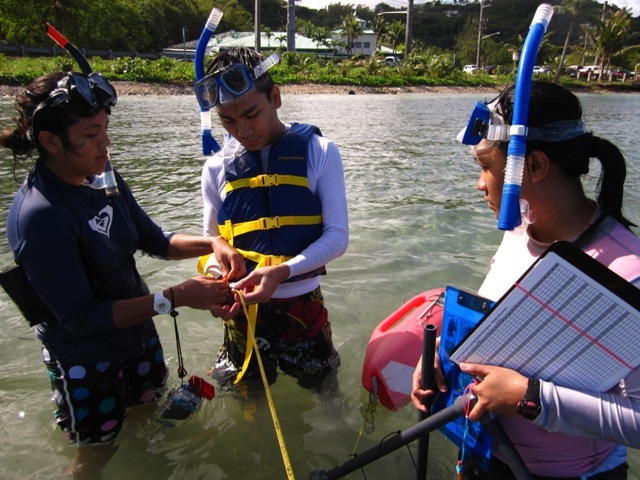 You will also be introduced to survey methods that are used to complete biological monitoring surveys on reef flats around Guam. Learn about different marine species you can spot on Guam’s reefs and they’re importance to the coral reef ecosystem! Our Classroom Training is also an opportunity for volunteers to meet and get to know one another before working together in the water. Once you completed Classroom Training, you follow up and complete your Community Monitoring Training at this event. Here, you will use the two survey methods learned in class. First, there will be a recap of survey methods (to refresh your memory! ), a water safety briefing, and then we head to the water! Before starting surveys, program staff and assistants do a quick Species ID session to introduce you to some of the marine species that you’ll commonly find on the site. After Species ID session, you will complete one benthic habitat survey and one macroinvertebrate survey using datasheets, field guides, and monitoring equipment. 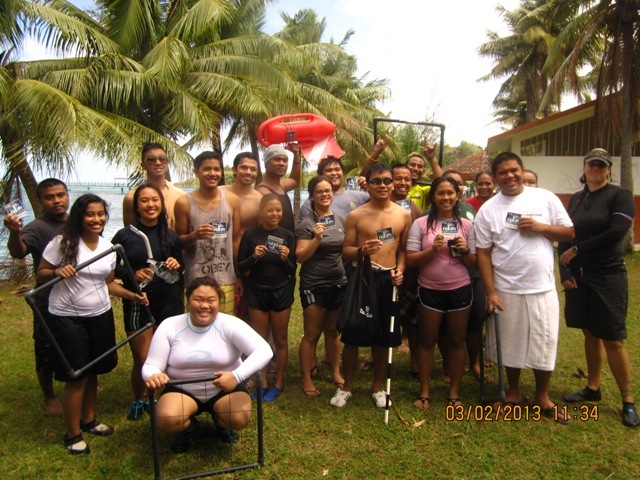 Volunteers always have fun discovering the cool marine life while doing their surveys! I am a Navy spouse, fairly new to the island, and am pursuing a second degree in Biology at UOG. I would like to know more about your organization, and hopefully work with you for the next few years. It’d be great field experience to do coral reef monitoring while you’re at UOG. There are other ways you can get involved with our program. Send us an email at gureefmonitoring@gmail.com or call 646-1905 to chat more about it. Come to our REEF Celebration next Saturday at GCC. See our blog post for more info. Hope to meet you there. You can also email us at gureefmonitoring@gmail.com so we can add you to our email list and notify you of upcoming events.